Available for sale is Darth Vader (2015) #3 graded by CGC in 9.4 NM condition and featuring the first appearances of Doctor Aphra, Triple Zero and BT-1. Available for sale is the eBay Exclusive Variant of Return of Wolverine #1 graded in 9.8 NM/M Condition. This limited edition comic was published by Marvel Comics in 2018 and distributed by My Comic Shop to be sold exclusively on eBay. Only 3,000 issues of this Neal Adams variant cover were printed. 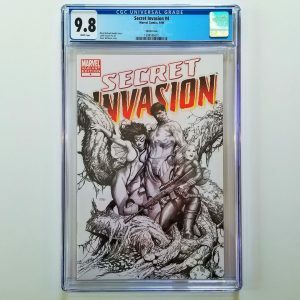 Available for sale is the Steve McNiven 1:75 Sketch Variant of Secret Invasion #3 graded by CGC in 9.8 NM/M condition featuring the first appearance of the Secret Warriors as a team. According to the CGC Census there are only 57 issues graded in 9.8 condition, making this a relatively hard to come by high grade variant. With rumors abound that the Secret Invasion storyline will be played out in the MCU following the events of Avengers 4, now’s the time to grab this high-grade comic for your collection. 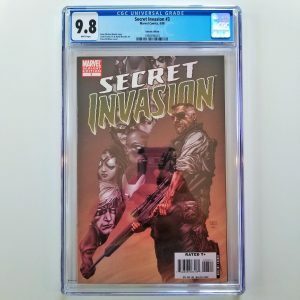 Available for sale is the Steve McNiven 1:20 Variant of Secret Invasion #3 graded by CGC in 9.8 NM/M condition featuring the first appearance of the Secret Warriors as a team. According to the CGC Census there are only 97 issues graded in 9.8 condition, making this a relatively hard to come by high grade variant. With rumors abound that the Secret Invasion storyline will be played out in the MCU following the events of Avengers 4, now’s the time to grab this high-grade comic for your collection. 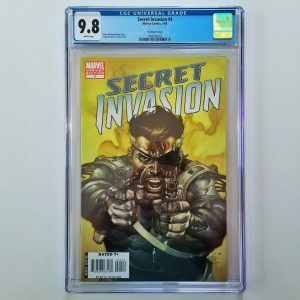 Available for sale is the Leinil Francis Yu 1:20 Variant of Secret Invasion #4 graded by CGC in 9.8 NM/M condition. According to the CGC Census there are only 2 (TWO!) issues graded in 9.8 condition, making this a hard to come by high grade variant. With rumors abound that the Secret Invasion storyline will be played out in the MCU following the events of Avengers 4, now’s the time to grab this high-grade comic for your collection. 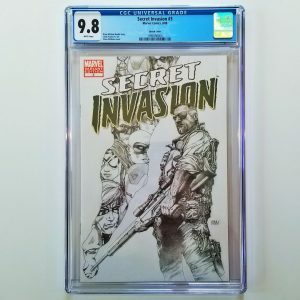 Available for sale is the Steve McNiven 1:75 Sketch Variant of Secret Invasion #4 graded by CGC in 9.8 NM/M condition. 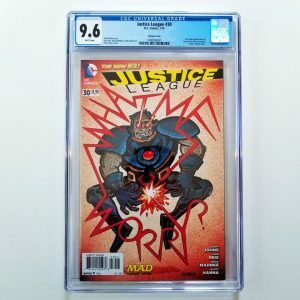 According to the CGC Census there are only 59 issues graded in 9.8 condition or better, making this a relatively hard to come by high grade variant. With rumors abound that the Secret Invasion storyline will be played out in the MCU following the events of Avengers 4, now’s the time to grab this high-grade comic for your collection. Available for sale is Amazing Spider-Man #124 graded by CGC in 8.0 VF condition featuring the first appearance of Man-Wolf. This classic bronze age Spider-Man tale is the perfect addition to your graded comic collection. Available for sale is Amazing Spider-Man #252 graded by CGC in 8.5 VF+ condition featuring the first published appearance (tied with Marvel Team-Up #141) of Spider-Man’s black symbiote costume. As the story of the black suit has become more iconic over the years, eventually becoming Venom, the first appearances of Spider-Man wearing the black costume have become highly collectible. Grab this key issue today while you can! This is a must-own key issue for any comic book collector. Amazing Spider-Man #361 CGC 9.2 featuring the first appearance of Carnage. With Sony Pictures getting ready to release a Venom movie, you can expect demand to steadily rise (and thus the prices) for related comic book issues like this one. This is a must-own key issue for any comic book collector. Amazing Spider-Man #361 CGC 9.4 featuring the first appearance of Carnage. With Carnage set to join the Venom movie franchise, you can expect demand to steadily rise (and thus the prices) for related key comic book issues like this one. Grab it while you can! Available for sale is the first printing of Amazing Spider-Man #362 graded by CGC in 9.4 NM condition. Featuring the 2nd full appearance of Carnage, this modern key is becoming more collectible especially with the Venom movie set to come out this fall where Carnage is expected to make a surprise appearance. Grab this hot slab today while you can. Available for sale is the first printing of Amazing Spider-Man #363 graded by CGC in 9.6 NM+ condition. Wrapping up the three issue arc of Carnage, Spider-Man and Venom, this modern key is becoming more collectible especially with the Venom movie set to come out this fall where Carnage is expected to make a surprise appearance. Grab this hot slab today while you can. Spider-Man meets President Barack Obama! This near mint+ issue of Amazing Spider-Man #583 CGC 9.6 is perfect for any collector of graded comic books. The graded comic listed here recently sold via my eBay Store for $174.99. Click here to find others like it! Available for sale is Amazing Spider-Man #795 graded by CGC in 9.8 NM/M condition featuring Norman Osborn joining with the Carnage symbiote to become the Red Goblin! This story arc has been hot has only going to get hotter. Grab this highly collectible slab today while you still can, it won’t be here long!